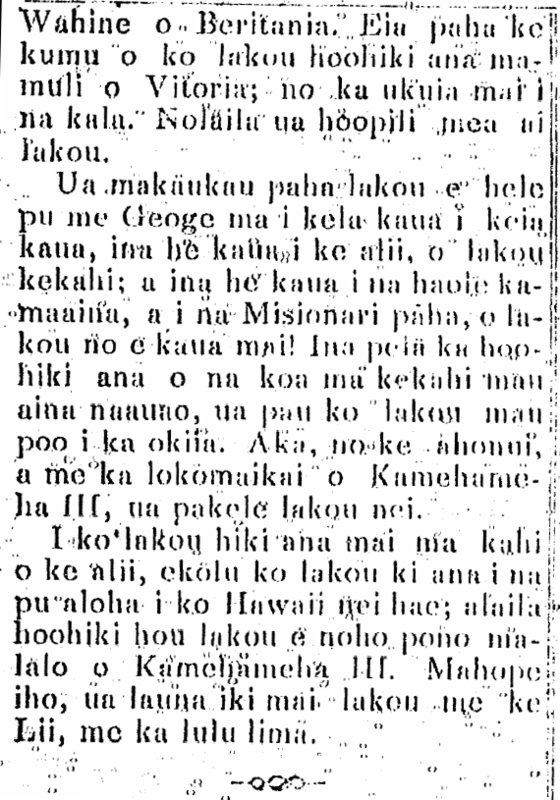 Even more from Ka Nonanona, August 8, 1843. When we reached the residence of the king, at Honukaopu [Honokaupu ? 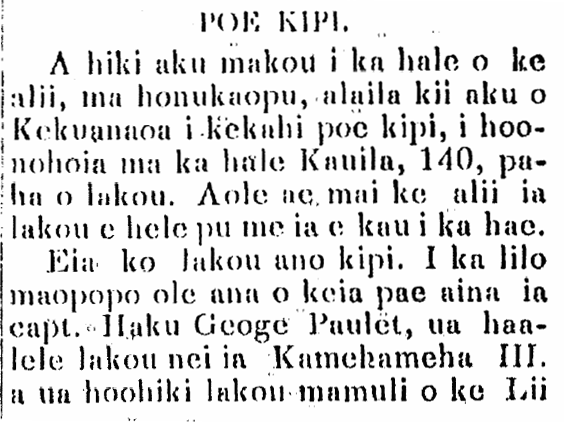 ], Kekuanaoa fetched some traitors who were kept at Hale Kauila; perhaps there were 140 of them. The king did not allow them to accompany him to raise the flag. This is the nature of their treason. When this archipelago was not clearly under Capt. Lord George Paulet, they left Kamehameha III, and they swore allegiance to the Queen of Britain. This is probably the reason they swore allegiance to Victoria; because they were paid money. They therefore curried his favor [hoopilimeaai]. They were probably prepared to go with George to this war and that; if he warred against the king, so too would they; and if he went to war against the local haole or the Missionaries, they would fight as well! If soldiers of enlightened lands took an oath in this fashion, their heads would fall. But because of the patience and goodness of Kamehameha III, they were saved. When they came in the presence of the king, they gave a three gun salute to Hawaii’s flag; and they swore once again to live obediently beneath Kamehameha III. After that, they spent time with the King, and shook hands. Ka Nonanona, Buke 3, Pepa 6, Aoao 26. Augate 8, 1843.